Extend your Reach... Reach your Goals with ADaM ReCON (Wireless Remote CONtact Manager). Using wireless mobile technology like iPad, tablets and smartphones, your sales people can take customer and prospect information out of the office and into the field. 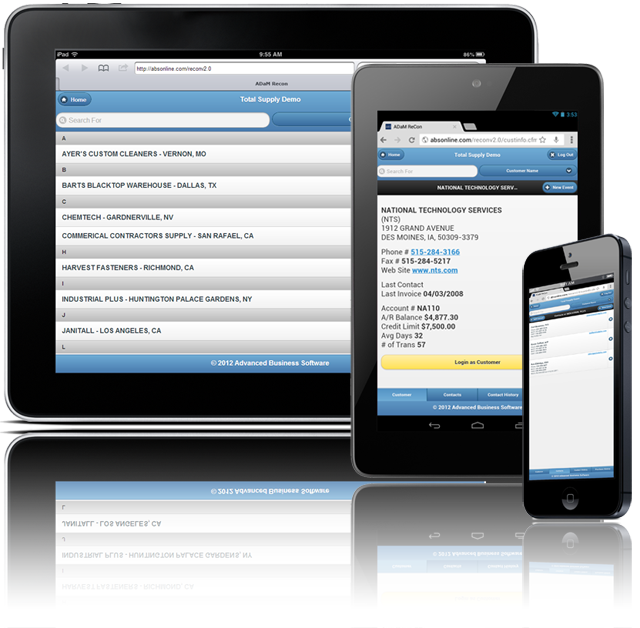 Customers can be looked up by Company name, Contact name, Zip Code, and more. The real-time information available for each customer includes name, address, and contact phone numbers, e-mail addresses, Customer comments, Contact history and Purchase history. Contact events can be recorded in the field updating the main database wirelessly and immediately in real time. Filter options allow for all customers or just the salesperson's customers, all contacts names or selected contact names. Purchase history can be limited to transactions since a given date or all purchases. Direct real-time information from ADaM to any mobile device with an internet browser. Look up by Company name, Contact name, or Zip Code. Display Customer Name and Address, Phone, Fax, Last Contact Date. Display Multiple Contacts per customer. Display Contact history with notes. Display Customer purchase history with Item, Description, Last Date, Price, and Quantity. Add a contact event and synchronize with the main database.